Remove Samsung J4 FRP Lock Required File. 1# Download Quick Shortcut Maker Apk. 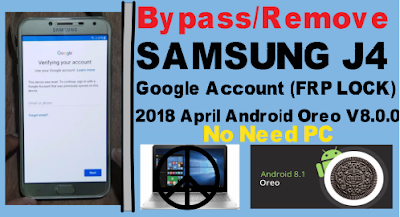 2# Download 2018 Oreo V8.0.0 FRP Remove Apk. Remove Samsung J4 FRP Lock Method. 1# Connect your phone on wifi. 2# Open talkback ( Click 3 time home buttion same time). 3# Now enable talkback.Go to talkback setting. 4# Again click home buttion 3 time now disable talkback. 5# Go to help and feedback. 6# Now open get start with voice access. 7# Play video and share other option. 11# Download Quick Short CutMaker Apk. 13# Open Setting like video. 14# Go to Lock Screen & Security"
15# Again open other Security Setting. 16# Go to Device Administrators & Deactivate. 19# Install Google Play Servic. 20# Again go apps and enable googe play servic. 21# Now Logine your new gmail id. 22# Rebot your phone open normal mode. 25# Your Phone frp lock remove complite. If You Have Some Problem Related With This Post.You Should Watch This Video.